Born To Fight and Barthelona are the two representatives of the stable on the Hillside track at Sandown on Wednesday. Born To Fight runs in race five, the 3YO Benchmark 70 Handicap over 1400m with Dwayne Dunn to ride and jumping from barrier four after scratchings. Mike Moroney is happy with the way Born To Fight has trained on since his excellent second at Warrnambool during the May carnival. “He’s getting fitter all the time and still learning, he’s got a lot of raw talent but he just needs to put it all together,” Moroney said. “We’ve left the blinkers on him to help but he has come up against what looks a strong field here. Barthelona (pictured) is in race seven, the Benchmark 70 Handicap over 1400m with Jack Martin claiming three to reduce his weight to 57.5kg. 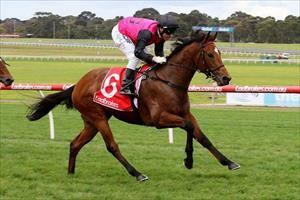 It is the third run this campaign for Barthelona who finished fourth over 1100m at Warrnambool during the May meeting. “He’s drawn out wide and by the time his race is run that may not be the worst place to be,” Moroney said. “He’s up to 1400m for the first time but the way he ran last start suggests that is what he wants so we will give him his chance here.